Another one from my mother, again edited by me. The Sun is glaring. Sweat drips from my forehead. In this weather, I don’t have much of an appetite. So what am I going to have for lunch? Cold noodles! This is a typical lunch, or sometimes dinner, during the very hot and humid summer in Japan. For more nutritional value, I add boiled eggs or slices of cheese for lunch, and other dishes for dinner. There are three varieties of noodles, determined by their thickness (much like spaghetti). The skinniest one is called Soumen, which has a diameter of less than 1.3mm. The next one is Hiyamugi, with a diameter of 1.3mm to 1.7mm. Noodles of a thickness over 1.7mm in diameter is called Udon. However, usually, we eat Udon in a hot broth. Why, you ask? I actually don’t know but I think fatter noodles can’t be swallowed as easily and smoothly as skinny ones. And since we eat cold noodles faster than hot ones, this is important. I grew up with Hiyamugiate. Soumen was too thin for me. Buckwheat noodles, called soba, can be eaten cold or hot, but there is only one size. When eaten cold, Zaru Soba should have a firmer texture. Therefore, we have never serve cold Soba in water, like hiyamugi and soumen. When you serve cold Soba, place some ice cubes on top of the noodles to keep them cold, and the dipping sauce and condiments on the side. The cooking time is different depending on your preference. After the noodles have been cooked, rinse them with cold water several times (not just once like spaghetti). I usually prepare two or three batches of dipping sauce. I simmer the sauce, a combination of soy sauce, mirin, fish stock, and sugar to taste, to become 2/3 or 1/2 of the original amount. After cooling it down, you can keep it in the fridge for about 2 weeks. The sauce is very strongly flavoured because when you dip the cold noodles in it again and again, it will become diluted with water so it needs to be strong. 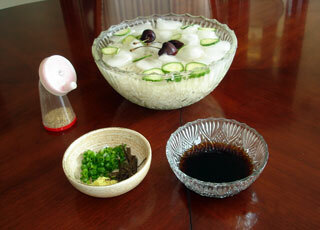 If you see a picture of cold noodles with ice cubes floating on top, slices of cucumber, cherries in the center all in a large glass bowl, I am sure it will whet your appetite. We usually present cold nooldes in this way. Japanese people think presentation is very important as well as taste. In Japan, they use canned cherries because fresh cherries are too expensive. The pink color of canned cherries and the green color of cucumbers is a feast for the eyes. But in Canada, I use fresh cherries because they aren’t as expensive.